President Lincoln Club Pioneer - Abraham Lincoln - Presidents and Political - Vintage Postcards | VintagePostcards.com: vintage, old, antique postcards for collectors. 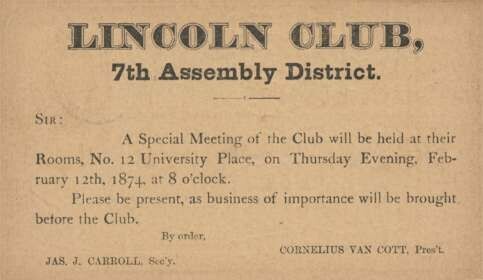 "Lincoln Club, ..A Special Meeting of the Club will be held at their Rooms,...February 12th, 1874 ...Jas. J. Carrol, Secretary." Political, patriotic, civil war, black. Printed on government postal card. Used.